Bring Back Bounce and Shine to Tired Winter Locks with Alberto VO5® Hair Care Products! In my household, there is a lot of hair. My teenage daughters and I all have long locks that tend to get pretty dry and lifeless, especially after the winter we have had. I have always trusted Alberto VO5® to help bring out the beauty in our hair. I was recently sent samples of some really wonderful Alberto VO5® products to review. I received Salon Series Smooth & Sleek Shampoo and Conditioner, Simply Stunning Leave-in Conditioner, V05 Hot oil treatment, Total Recovery Hair Mask, and Perfect Hold Aeresol Hair Spray. VO5 Salon Series Smooth + Sleek with a unique smoothing complex helps frizzy, unruly hair become miraculously manageable and flawlessly smooth from roots to ends™. My Experience: This shampoo is luxurious. It cleans the hair beautifully and smells amazing. My daughters often use a straightening iron on their hair and this shampoo helps it to look extra shiny and sleek without frizzing up. 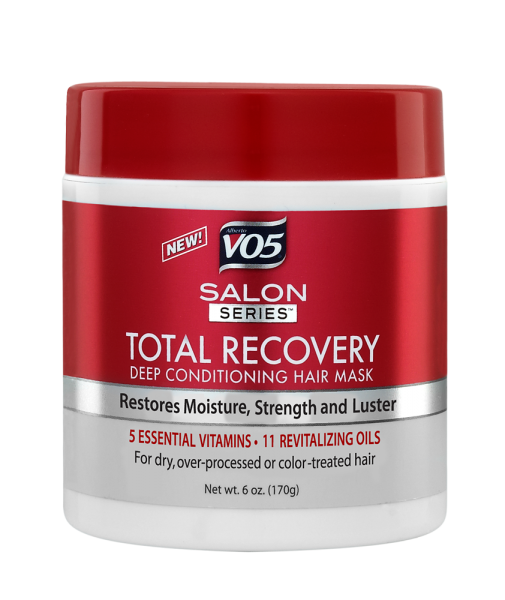 VO5 Salon Series Smooth + Sleek Conditioner also contains a unique smoothing complex which helps frizzy, unruly hair become miraculously manageable and flawlessly smooth from roots to ends™. My Experience: This conditioner works perfectly with the Smooth + Sleek Shampoo for shiny, beautiful hair. My daughters and I love how it makes our long hair smooth and free of frizz. Give your hair a beauty boost and rescue even the most stressed strands. Total Recovery deep conditioning hair mask transforms dull, dry or damaged hair and helps restore body, shine and strength. Formulated with vitamins, proteins and amino acids, it nourishes fragile ends and improves elasticity to help minimize breakage. My Experience: This is one of the best hair masks on the market that you can simply get at the grocery store. It works just as well as more expensive ones that you buy in salons. It truly restores moisture and shine to dry, damaged hair. We love it! 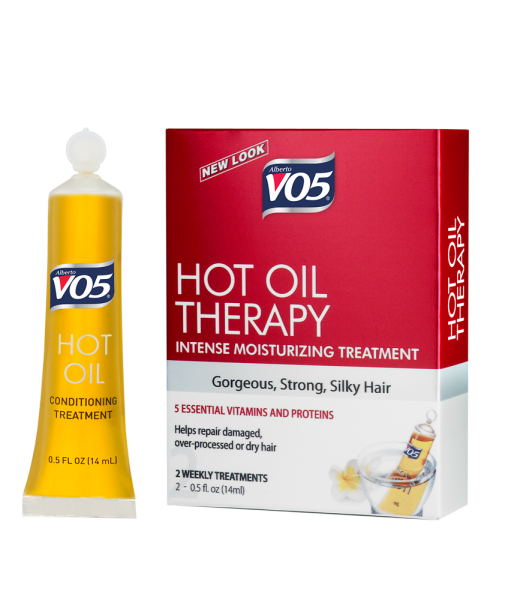 Indulge yourself in VO5 Hot Oil Therapy’s 5-vitamin and protein rich formula. Soothe your scalp and senses while moisturizing and conditioning hair from roots to ends, helping to restore shine, strength and silky softness. My Experience: Love this stuff! It is an easy restorative treatment that I use about once every two weeks. It makes the hair beautifully silky, soft and shiny. Split ends just disappear. It is a miracle! This all-in-one styling miracle is your secret weapon to easily style your hair and put your best look forward! Protective conditioners saturate hair with moisture and a vitamin-enriched formula helps protect hair from heat and strengthens hair against split ends and breakage. You’ll be simply stunned by the results. My Experience: This wonderful leave-in conditioner is perfect for spraying all over in your hair after you have washed and towel-dried it. Sometimes my hair needs something a little extra, and even if I have already used conditioner in the shower, I still use this amazing leave-in treatment for that extra detangling, softening factor. My hair is left silkier than ever! I even use it between shampoos to restyle my hair for extra moisture when it is dry. VO5 Salon Series™ Perfect Hold Aerosol Hairspray is infused with 5 Essential Vitamins™ to help fortify your hair for a healthy shine that perfectly finishes any style. Experience salon-quality hold and long-lasting control without stiffness or stickiness. Indulge daily without flaking or residue buildup. My Experience: This hairspray is the perfect finishing touch to hold my style in place. It has a great all-day hold and I love how it does not build us and cause flakes, even if I skip a day of washing my hair.